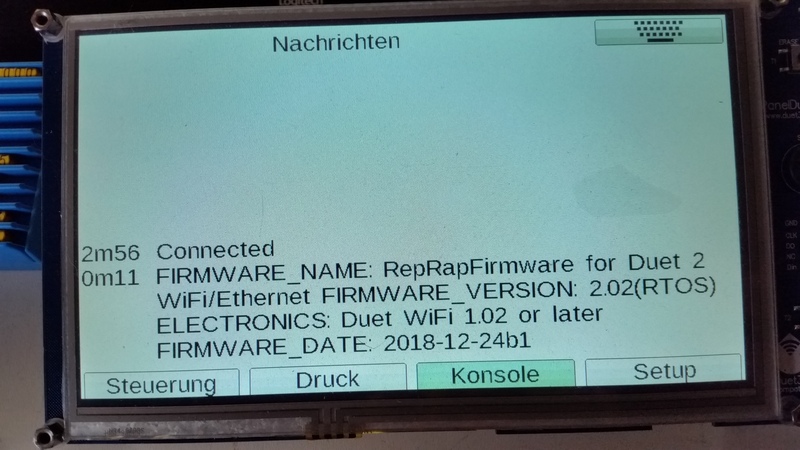 one of our clients got strange Wifi problems with a Duet 1.04a board running on FW 2.02. It is not possible to get the Wifi running or to include it to the excisting WLAN. We also tried to bring it up as an access point without success. @dc42 @T3P3Tony - any ideas? Try re-flashing the WiFi firmware. Copy DuetWiFiserver-1.22.bin into /sys on the SD card and rename it DuetWiFiserver.bin Then send M997 S1 to install it. After reinstalling the wifi server by copying the files on the SD Card localy, sending M997 S1 over the PanelDue results in testing baudrautes but doesn't give any other messages. After booting the wifi up again, the following config leads to the error "Failed to retrieve network list"
Please replace the Duet. It seems that the WiFi module is faulty. @dc42 - OK... Any tests to verify this? If the attempt to reinstall the WiFi firmware eventually resulted in message "Failed to connect at any baud rate", that is enough evidence. It should normally connect at the first baud rate that it tries. PS - I forgot to mention: make sure the Duet has adequate power when trying to upload WiFi firmware. In particular, a USB port on a laptop may not provide sufficient power if a panelDue is connected. It's best to use VIN power.